Maybe it's Spring, maybe it's the Zeitgeist that reflects an era of environmental awareness, but green kitchens are all over the style magazines. Some are green in colour, others manufactured to "green" principles, but all appeal to me. Once I'd have worried that picking such a strong color could quickly feel dated but these kitchens are so fresh and modern I think they'll go the distance. 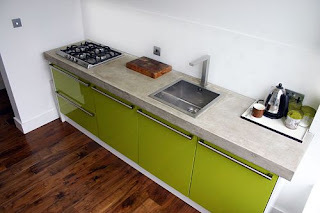 Andy and Karen Lacey, the UK based designers behind retro children's furnishings collection Olli & Lime, shared their appropriately lime green kitchen with Design Public's Hatch blog. The kitchen pairs bright green cabinets with soothing grey concrete counters. It may be tiny but it's very efficient - when everything is within reach you edit your kitchenware down to the indispensable, and you limit your movements, too. Small is gorgeous! UK design magazine wallpaper* features another compact kitchen, this time in Hunter Green, in their May issue, styling it with abundant herbs and vegetables. Hunter Green has long been a standard in British kitchens, with AGA stoves to cook on (and warm your house) that have been available for decades but this takes the deep colour to the rest of the kitchen. 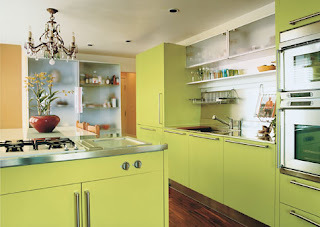 Bon Appetit magazine showed an award-winning eco-friendly kitchen from Arclinea San Diego that pairs chartreuse green (they call it Papaya Yellow) cabinets with stainless steel counters and all the bells and whistles you could possibly want from a kitchen. Think green cabinets are too modern for your traditional house? 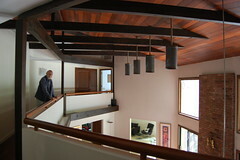 Check out this pantry that's part of a "green" article over at The Kitchen Designer blog. It's sure to change your mind. What do you think of the green kitchen trend? Strikingly beautiful and sure to stand the test of time or too reminiscent of the seventies avocado nightmare? i think eventually it'll look like an avocado nightmare - but for now, i say it's pretty darn cute! I'm leaning toward the yellower version. Our kitchen walls are Benjamin Moore 2027-50 "Hibiscus." We like it. I changes a lot as the sun transits. @modernemama Thanks for posting! That's not the entire kitchen btw - there's a wall of white cabinets/with appliances opposite! Green is my favorite color and as a matter of fact, my kitchen is also green. I have green glass subway tile that I'm crazy about. I think you can see it here. Andy: I thought that was it because one wall of lower cabinets was all we had in our London flat - and I loved it, it was minimalism at its best: a saucepan, knife and a wok produced a lot of good cooking! Puna - that's a great green, is it pistachio? Though "geen" as my grandson calls his favorite color, is a naturally beautiful color with so many different and glorious shades, I am not a fan of green in the kitchen. I could never eat split pea soup because of the "pukey" color. Just my personal preference. They'll definitely be the avocado fridges... but with a coat of paint, they could be refreshed easily in 20 years when it becomes tre pase. Color (especially painted color) is so easy to change! Hands down, I like the first one the best. Maybe it's the concrete countertop. Actually, I was thinking of getting the Jacobsen Series 7 chairs in that exact color for my breakfast area. Good finds! And, thanks for the mention! Oy - just when I had buried the memories of avocado green in a kitchen! I hadn't tied it together with the fresh new green kitchens, but now I won't be able to NOt think about it. ha! I especially love that last kitchen. 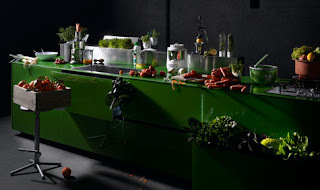 I think for myself personally, I'll stick to the environmental "green" for my kitchen, but kudos to those more adventurous that go green in color! I really like the first one. Great for a get away home. Terry, I so just pulled out the well worn BenMoore paint fan. Hibiscus is a great color. I think these kitchens are a lot of fun to look at. Very fresh and cheery. I couldn't commit to it in my own kitchen, but I'm glad there are people who are brave enough to try things like this!